South Adelaide have fallen by 32 points to an AFL-powered Port Adelaide at Alberton Oval on Saturday afternoon. Playing against a Port Adelaide side boasting 19 AFL listed players, the Panthers were unable to recover from a first quarter Magpie onslaught to fall to a 7.9 (51) to 12.11 (83) defeat. For the second round in a row the Panthers were forced to defend against a strong breeze in the first quarter. With the wind at their backs, the Magpies kicked the first five goals of the match before the Panthers could answer through Abe Davis. By the first break in play the home side had opened up a 32-point advantage. The loss leaves South Adelaide's finals chances hanging by a thread, trailing fifth-placed Glenelg by two games with just three rounds remaining. South did fight back in the second term, holding the Magpies firepower to 1.1 against the breeze and kicking 2.3 themselves thanks to Davis' second and Matt Raitt kicking truly after the siren. Tom Fields got the third term off to a great start for the Panthers, goaling inside two minutes. However, Port Adelaide again flexed their offensive muscles in the third term, kicking the last 4.5 of the quarter with the wind behind them. The Panthers were forced to move the ball under immense pressure, as the visitors were out-tackled 51-93. Meanwhile, Port's skill by hand and foot allowed them to make the most of the wind advantage, move the ball swiftly around the ground and set up several damaging counter attacks. Ultimately, the home side controlled the forward entries 48-35. 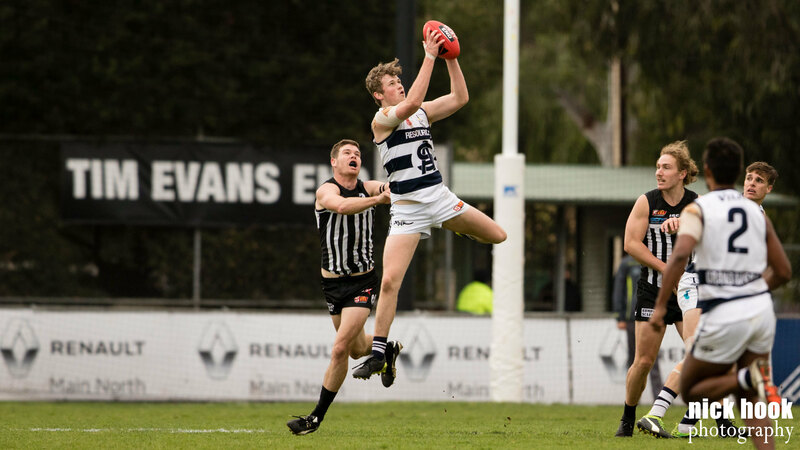 South did get the scoreboard ticking over in the final term, but it was too little too late and by the final siren the margin was the same 32-point deficit that had been established at the end of the first quarter. Dual Magarey Medallist Joel Cross played a brilliant match, gathering a game-high 29 possessions (17 contested), 10 clearances and a goal. Likewise, the old firm of Nick Liddle (24 touches, five tackles and five clearances) and Matt Rose (20 disposals and a goal) also battled hard all afternoon. The forward pressure and aggression of Matt Raitt (15 possessions and a team-high seven tackles) was another highlight, while the defensive duo of Tom Fields and Luke Durdin also performed well in a backline that was under great pressure at stages. Strong contributors for the Magpies were AFL-listed pair Will Snelling and Brandon Ah Chee, who racked up 66 touches, 17 clearances and 19 tackles between them, while young tall forward Todd Marshall (three goals) was a headache to contain up forward. The Panthers are next in action this Saturday afternoon at Hickinbotham Oval (2:10pm, August 12) against Woodville-West Torrens in a must-win game to keep South's finals hopes alive. South Adelaide's Reserves suffered a 58-point defeat at the hands of Port Adelaide at Alberton Oval on Saturday afternoon. The Panthers were unable to contain a well structured Magpies outfit that utilised the wind to devastating advantage and fell to a 5.5 (35) to 13.15 (93) loss away from home. Despite the loss, South hold their position in fifth on the ladder and remain in finals contention. South Adelaide kicked with the wind at their backs in the first term and controlled much of the early play. However, the visitors were unable to apply any serious scoreboard pressure and the two sides entered the first break tied at 13 a piece. Conversely, the Magpies were able to open up a 27-point advantage by halftime, kicking 5.4 to 1.1 towards the Scott Hodges end. In total 12.14 of the total 18.20 scored between both sides was kicked with the wind. A goalless third term did not help the Panthers cause, before Port put the result beyond doubt in the final term. Midfielders Alex Moyle and Richard Newell were the Panthers most prolific ball collectors, gathering 52 possessions between them. While Bryce Damin was again impressive as a key forward, kicking a goal, and pinch hitting in the ruck. The Reserves are back in action this weekend from 11:30am, Saturday, August 12 against Woodville-West Torrens at Hickinbotham Oval.